This is an optional Hobbywing C1 Motor Heatsink and Fan Combo. This aluminum housing heatsink will fit any motor with a diameter of 36mm and will help dissipate heat away from the motor. Bought for Tekin Pro4 HD 4300 in a Tekno 410.3. The diameter is fine but the length is an issue. I trimmed off somewhere around 1/8" from each side. I'm using a large zip tie to prevent the heat sink from sliding into the motor power posts. It's a tight fit in the 410.3. Smaller pinions will require shaving the risers on the side to clearance the middle support brace, or remove the brace. Overall I think this is a good product although I didn't expect it to (possibly) be specifically and only for Hobbywing motors. At least I hope that it would require no modifications to fit on Hobbywing's own products. I haven't had the chance to use it yet but I expect it to perform adequately. It's a couple mm too skinny and doesn't fit the Traxxas Velineon 3500 motor. Pretty disappointed since the description says it fits any 36mm motor. It's also too long so you'll have to cut it as well. Not sure how the other reviewer said he got it to fit his Slash 4x4. UPDATE: Had to do a lot of measuring, cutting, sanding, and bending, but I finally managed to get it to fit. Used a generous amount of thermal paste. Motor temps dropped down from 200 to 135, I couldn't believe it. This is a beefy setup after you finally get it to work. Still gonna give it 3 stars though because it takes a lot of work. Bought this for my xerun sctpro combo. read the description first it is a huge heat sink and fan! I will fit the old style xerun with the long can motor.... Not the new style! It is a nicely made part and the fan moves a lot of air. I am impressed with the quality of the product but feel the description should have mentioned that it would not fit the new style motors. "This is an optional Hobbywing C1 Motor Heatsink and Fan Combo. This aluminum housing heatsink will fit any motor with a diameter of 36mm and will help dissipate heat away from the motor." 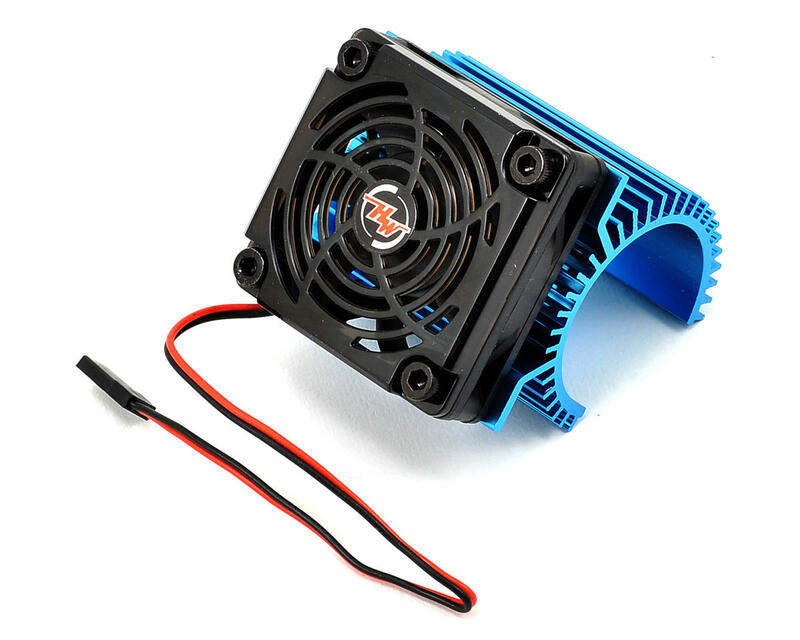 Heat Sink Diameter: 36 x 55mm"
Works very well to reduce motor temperatures. However, it will only fit on a 550 size motor and NOT a 540 size motor like a traxxas VXL. Pretty good fan, ordered for a slash 4x4 didnt see it was for 1/8th motor. Cut the heatsink, and now it works great on my slash 4x4 and keeps the motor very cool.